At the bottom of the post is a link from MALAGA SPAIN where we can watch the AMAZING HOLY WEEK processions that take place everyday this week. You have to watch this, it is AMAZING! Holy Week is a time of great penance and reflection. It is the most important time of the year to reflect on Jesus’s approach to the Cross. As Jesus’s Passion approaches it is a special time to reflect on what He did for me, my family, and the entire World ; how Jesus willingly chose to go through torture, humiliation, and execution for all of us, knowing that MANY would turn their backs on Him. I think about the twelve Apostles and their last week with Jesus before His Crucifixion on Good Friday. I will contemplate the Last Supper, what happened at the Garden of Gethsemane, the Scourging at the Pillar, and the rest of the Sorrowful Mysteries. Like St Ignatius of Loyola suggests : I will try to imagine being at these actual places and take part in what happened. Some suggestions: look at Jesus’s hands as He turns the simple bread into His Body. Watch His hands as He holds the chalice of wine and turns it into His Blood. Watch Jesus wash the feet of His Apostle’s ; always teaching us through His Word and His actions. Imagine the way Jesus felt at the Last Supper knowing that Judas was going to betray him for thirty pieces of silver. Can you imagine? Betray your Creator, Jesus, whom you just spent the last three years of your life with ? To be honest, every time I commit a sin, I betray Jesus! Every time I sin, I add a lash to His Scourging. Every time I sin, Jesus sweats a tear of blood because of me. Every time I sin, I strike the nail through His hands and His feet. Every time I sin, I pierce our Lord through His precious side! Let me never forget dear Lord that you carried and assumed all of my personal sins onto yourself! Jesus in His human nature, literally took all of the sins of mankind into and onto His body. Can you imagine the actual weight of all of mankind’s sins ; past, present, and future? I have a hard time living with my own sins, never mind someone else’s. Think about it. Can you imagine carrying around someone else’s sins? Jesus didn’t just do it for those who love Him. Jesus chose to take the sins of those who hate him to! Thank you Jesus! Holy Week Video from Spain with a live link for Holy Week Events ! Click on En Directo and you will have live feed of Holy Week from Spain. Here is a link for the schedule of Holy Week events. Please join us A.D. April 10 2017 C.LF. (Centenary of Our Lady of Fatima) as we begin our 33 Day Consecration to Jesus Through Mary. Our Consecration date will be on the Feast Day of Our Lady of Fatima! Canadian Catechist has been telling me people have been asking him about how to go about doing this consecration. Well, here you go! Step 1: Choose a Marian feast. Well, we already chose one for the sake of this blog series: Our Lady of Fatima. But if you feel like Mary is calling you to a different day, you can choose another Marian Feast. Some examples are the Annunciation (March 25), Visitation (May 31), Our Lady of Perpetual Help (June 27), Presentation of Mary (November 21), and Immaculate Conception (December 8). Step 2: This step has multi parts to it. A. Work 33 days back from that day. For example, for Our Lady of Fatima, your start date will be April 10. Which means you have to complete steps B-D before April 10. Preparation for Total Consecration: This one, by St. Louis de Montfort, is the classic one that most people use. You have a series of prayers that you say each day and then have other reflections associated with it each day. It is divided into four phases. You can find it here (https://www.amazon.com/Preparation-Total-Consecration-Louis-Montfort/dp/0910984107/ref=pd_sbs_14_t_2?_encoding=UTF8&psc=1&refRID=97AMFYB7DFNPR5GG5P7A). This is the one I used last time and definitely the one I would use again. 33 Days to Morning Glory: This one, by Fr. Michael Gaitley, is another way people have done the consecration. It is divided into five parts and features different Saints. Personally, it is for those who need something easy for the first time to go through it (if you do not have a lot of time). It is very simplified and to the point. I am sure if you want to combine it with St. Louis de Montfort’s it would be fine. If you do this one, it is not that you will not receive as much graces as if you do one of the others, but you may find it “basic” in nature. http://www.fisheaters.com/totalconsecrationmontfort.html they have the 33 Days listed and divided into a four week period. This is the St. Louis de Montfort text. C. Spend your Lent reading True Devotion of Mary by St. Louis de Montfort. I did not do this the first time I consecrated myself to Jesus through Mary, but I will this time. D. The weekend before you begin the preparation, I strongly suggest going to the Sacrament of Confession. This will help you have graces to get through the preparation, because I will attest, it can be difficult, and you will face spiritual warfare. Step 4: On April 10 (or whatever day you start), you go through the 33 days. Try to frequent Communion as much as possible during this time. Step 5: On the 34th day, you go to Confession, go to Communion, give alms (if you want, in the form of a votive candle is fine) and then write out the Consecration prayer on a piece of paper, signing it and dating it. You can also find the Consecration prayer listed on the Fisheaters website I posted above. Hang it up in a place that you can always remember how you consecrated yourself to Jesus through Mary. Why you Should do the Marian Consecration A.D. 2017 C.L.F…. Why you should do the Marian Consecration …. In life, when we want something, we more than likely ask our parents for it. When a guy wants to propose to his girlfriend, he should ask her dad. When we want to be able to gain permission to do something, we ask our parents. We are trying to gain something through it. Now, what if you could get closer to Jesus by asking His Mother to help you? That is something that for probably many of you seems second nature but in a lot of ways it does not at the same time. Mary is the one human in all of human history that is the closest to Jesus. No one will surpass her and not anyone will ever come close. She said “yes!” to the Angel Gabriel to have Jesus be conceived by the Holy Spirit. Mary’s body was made to have the son of God. With that said, in Mary’s humility, she always pointed towards to Jesus. She silently adored Him as He was in her womb. She pointed to him at the Wedding of Cana. It is no wonder that we Catholics turn to Mary so much. One way that throughout the centuries, people have turned to Mary is by the fact they consecrated themselves to Jesus through Mary. It is a way to serve our Lord better and to help Him be there more in our lives. The formalized version of this Total Consecration dates back to St. Louis de Montfort in the seventeenth and eighteenth centuries through his book True Devotion of Mary which led to Preparing for Total Consecration of Jesus through Mary. Throughout time, there have been other priests who have created books for the Total Consecration, but it is essentially the same thing: 33 days of preparation for giving yourself totally and completely to Jesus through Mary on a Marian feast. Once you do it, you should renew it every year on the same Marian feast hypothetically, but sometimes people do switch around Marian feasts. There are many articles online that explain why you should do the Total Consecration. The Saints have done it and advocated it throughout the ages. If you love Mary and Jesus and grow closer to them, it is a great way to do so! People can have spiritual warfare as part of it, but persevere – Mary will also help you! After all, she did crush Satan’s head. 2017 marks the 100th anniversary of Our Lady of Fatima. To this day, when Our Lady appeared to the shepherd children of Fatima is one of the best known Marian apparitions, and to think it is just within the past 100 years! There are so many reasons that even if you have already consecrated yourselves to Jesus through Mary for Our Lady of Fatima. The start date is April 10, which is the Monday of Holy Week. But why Our Lady of Fatima? Here is a few reasons …. The 100th Anniversary is on a Saturday: As part of the Consecration, you should go to Confession and Mass as part of it. Unless we make a habit of it, it can be hard to go to Daily Mass during the week because of work. But because it is on a Saturday, you are able to do all of those things since you do not have any obligations of a job! Plus Saturday is typically reserved as Mary’s day. May is Mary’s month. May is a month that we honor Mary. What more to show a way that you want to grow closer to her than growing closer to Jesus? The final war will be between Satan and the family: Revealed to be the final secret at Fatima, the final war that Satan will engage in is the war of the family. We see that battle being alive and well through the fact that there are so many broken families in today’s society. What more to be a witness on earth by having your spouse and you (with your family) do the Total Consecration? That will give you the spiritual strength to get through any hardship that gets in the way. It is a way to grow spiritually post-Lent: Since the first day of preparation just so happens to be during Holy Week, it is a great way to continue the graces you received during Lent of being more prayerful during the Easter season! Once you have consecrated yourselves, you are naturally going to be wanting to be more prayerful! There you have it. Four reasons why you should do it during this 100th year of Fatima. Stay tuned for a future post on resources! It is a breath of fresh air to hear this new Marian hymn written by Monsignor Florian Kolfhaus! Pleas keep Monsignor Kolfhaus in your prayers, he is a true Shepherd of Christ and has the deepest love for our Most Blessed Mother. Have a blessed Christmas everyone! Please come Mary! As her final phase of preparation for Christmas, the Church recites or chants the O Antiphons during Vespers of the Liturgy of the Hours. The O Antiphons express the Church’s longing for and expectation of the Messiah, and her startled wonderment at the fullness of grace which the Christ-Child is about to bestow on the world. Benedictine monks arranged these antiphons with a definite purpose. If one starts with the last title and takes the first letter of each one — Emmanuel, Rex, Oriens, Clavis, Radix, Adonai, Sapientia — the Latin words ero cras are formed, meaning, “Tomorrow, I will come.” In these words, the Lord Jesus, for whose coming we prepare in Advent and to whom we address these seven Messianic titles, now speaks to us. The O Antiphons not only bring intensity to our Advent preparations, but they bring our preparations to a joyful conclusion. Dec. 17 – O Sapientia: O Wisdom (Eccl 24: 5), you came forth from the mouth of the Most High (Sir 24: 30) and, reaching from beginning to end, you ordered all things mightily and sweetly (Wis 8: 1). Come, and teach us the way of prudence (Isa 40: 14). Dec. 18 – O Adonai: O Adonai or O Lord and Ruler (Exod 6: 13) of the house of Israel (Matt 2: 6), you appeared to Moses in the fire of the burning bush (Exod 3: 2); on Mount Sinai, you gave him your Law (Exod 20). Come, and with outstretched arm, redeem us (Jer 32: 21). Dec. 19 – O Radix Jesse: O Root of Jesse, you stand for the ensign of all mankind (Isa 11: 10); before you, kings shall keep silence and, to you, all nations shall have recourse (Isa 52: 15). Come, and save us, and do not delay (Hab 2: 3). Dec. 20 – O Clavis David: O Key of David (Apoc 3: 7), Scepter of the House of Israel, you open and no man closes; you close and no man opens (Isa 22: 22). Come, and deliver him from the chains of prison who sits in darkness and in the shadow of death (Ps 107: 10). Dec. 21 – O Oriens: O Rising Dawn (Zac 6: 12), Radiance of the Light eternal (Hab 3: 4) and Sun of Justice (Mal 3: 20), come, and enlighten those who sit in darkness and the shadow of death (Ps 107: 10; Lk 1: 78). Dec. 22 – O Rex Gentium: O King of the Gentiles (Hag 2: 8), Desired of all, you are the cornerstone that binds two into one (Eph 2: 20). Come, and save poor man whom you fashion out of clay (Gen 2: 7). Dec. 23 – O Emmanuel: O Emmanuel (Isa 7: 14; 8: 8), our King and Lawgiver (Gen 49:10; cf. Ezek 21: 32), the Expected of the nations and their Savior (Isa 33: 22), come, and save us, O Lord our God. In the last few months I have found myself reading the Great Prophet Ezekiel. I find his writings very mysterious, and at times hard to understand. 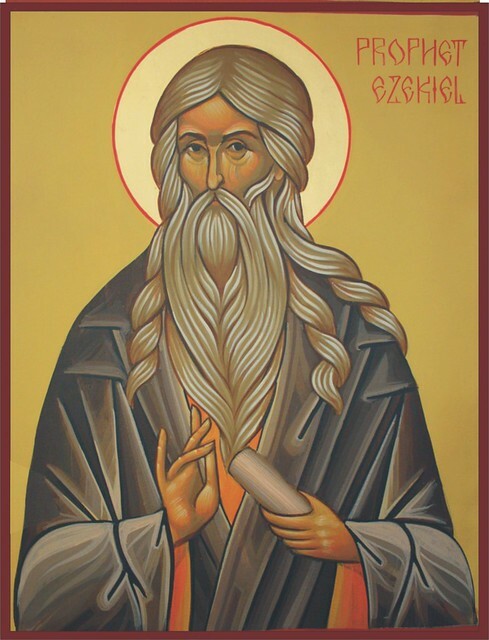 One thing that I have learned from studying Holy Scripture and Holy Tradition is that the WORD written down by Ezekiel inspired by God, can have many meanings. For instance, Ezekiel could have been writing to his Hebrew brothers and sisters, or perhaps the to Babylonians who had captured him and brought him a way from his home, OR maybe, just maybe, he could have been writing this for us. To make it even more confusing, the Great Prophet Ezekiel very well could have been writing for all of the above. That is the amazing characteristic of Holy Scripture, it can have so many layers and depths to it. The WORD can speak to the individual in a very personal and intimate way, and He can also speak to a group or country in a different way. In fact, the WORD speaks to us all, and at all times, we just need to listen, or read. And the word of the Lord came to me, saying:  Son of man, prophesy concerning the shepherds of Israel: prophesy, and say to the shepherds: Thus saith the Lord God: Woe to the shepherds of Israel, that fed themselves: should not the flocks be fed by the shepherds? You ate the milk, and you clothed yourselves with the wool, and you killed that which was fat: but my flock you did not feed. The weak you have not strengthened, and that which was sick you have not healed, that which was broken you have not bound up, and that which was driven away you have not brought again, neither have you sought that which was lost: but you ruled over them with rigour, and with a high hand. And my sheep were scattered, because there was no shepherd: and they became the prey of all the beasts of the field, and were scattered. Shepherds: That is, princes, magistrates, chief priests, and scribes. My sheep have wandered in every mountain, and in every high hill: and my flocks were scattered upon the face of the earth, and there was none that sought them, there was none, I say, that sought them. Therefore, ye shepherds, hear the word of the Lord:  As I live, saith the Lord God, forasmuch as my flocks have been made a spoil, and my sheep are become a prey to all the beasts of the field, because there was no shepherd: for my shepherds did not seek after my flock, but the shepherds fed themselves, and fed not my flocks:  Therefore, ye shepherds, hear the word of the Lord:  Thus saith the Lord God: Behold I myself come upon the shepherds, I will require my flock at their hand, and I will cause them to cease from feeding the flock any more, neither shall the shepherds feed themselves any more: and I will deliver my flock from their mouth, and it shall no more be meat for them. For thus saith the Lord God: Behold I myself will seek my sheep, and will visit them. As the shepherd visiteth his flock in the day when he shall be in the midst of his sheep that were scattered, so will I visit my sheep, and will deliver them out of all the places where they have been scattered in the cloudy and dark day. And I will bring them out from the peoples, and will gather them out of the countries, and will bring them to their own land: and I will feed them in the mountains of Israel, by the rivers, and in all the habitations of the land. I will feed them in the most fruitful pastures, and their pastures shall be in the high mountains of Israel: there shall they rest on the green grass, and be fed in fat pastures upon the mountains of Israel. I will feed my sheep: and I will cause them to lie down, saith the Lord God. I will seek that which was lost: and that which was driven away, I will bring again: and I will bind up that which was broken, and I will strengthen that which was weak, and that which was fat and strong I will preserve: and I will feed them in judgment. And as for you, O my flocks, thus saith the Lord God: Behold I judge between cattle and cattle, of rams and of he goats. It’s been a little while since I’ve posted here on Canadian Catechist. Why? Because I’ve been dealing with a “Storm” of my own. Some of it has come from outside of myself, and some of it has come from inside of myself. The truth is that all of us go through different “Storms” of our own. We can let our own personal “Storms” destroy us, or we can choose to use them as stepping stones to sanctification and a closer relationship with God. James Toups chose the latter. James Toups gives a very personal testimony of his personal storms in his latest book “The Storm: A Time of Mercy, Choices and Hope“. I don’t usually do book reviews on here, but James is such a great example of what a Catholic man should be that I really thought I should do a review. I really want my readers to meet the man I know as Jay. He is cool and calm under pressure, and now I know why. Everyone should read his book and learn from a man who has lots of experience dealing with the “Storms” of life. James shares his experiences of growing up in the Deep Cajun South of Louisiana. He shares with us his experiences as a son, father, grandson, and grandfather. He shares his experiences with life and death. We hear about the deep faith of nuns, teachers, and family members throughout his personal account. There are real “Storms” in the book also. Jay and his family had to face and evacuate because of Hurricane Camille and Hurricane Katrina. At every turn, Jay turned to God! Jay trusts in God’s Providence and in His plan. No matter how bad things got, Jay turned to God! We can all learn from Jay. Today, more than every, we NEED Hope! James Toups shares some of his hope with us in this wonderful book “The Storm: A Time of Mercy, Choices and Hope“. We are living in the midst of a “STORM” right now! How are we going to deal with the “STORM” that’s coming? Jay has the answer, we must turn to God and ask for His mercy. No matter how bad things get, we must KNOW that God is in control! God will allow really “bad stuff” to happen, but He will ALWAYS draw good from it in His way. Jesus I trust in THEE! I’m Alive! 10 Commandments Coming Soon! I will be catechizing on the 10 Commandments. Holy Week Video from Spain with a live link for Holy Week Events ! Click on En Directo and you will have live feed of Holy Week from Spain. Here is a link for the schedule of Holy Week events. Here is a link to live Holy Week events in Spain!!! Have a truly Holy Week ! Before I try and give a short catechesis on The Twelfth Article of the Apostles’ Creed I want to let my readers know that I have been having my own struggles about the direction that many in the hierarchy have been trying to steer Christ’s Ship. I know that many are in the same Boat as I am, and at times, I admit that I have been looking at the height of the waves and watching the storm instead of holding on to Jesus, Mary, and Joseph. I have had to be careful about reading too much of the Catholic news and blogs, and it has helped greatly! One thing that pains me greatly is the confusion and scandal that this current pope has caused with real faithful Catholics. It is not right. I could go on and on about the damage that he has done, but I won’t, that is not my job here, I’m going to share with you the ENTIRETY of TRUTH with CHARITY and CLARITY, the GOOD NEWS of JESUS CHRIST! My job and vocation is to be a loving husband to my wife, a loving father to my four beautiful children, and an arrow to the One, Holy, Catholic, and Apostolic Church. That’s right, an arrow. Everything I say and do should be like an arrow sign directing souls to Christ and His Church. I think we are all called to be “arrows” in a sense. The first question in many real catechisms goes something like this: What is the purpose of life, or why are we born? The answer is: to praise (to know), reverence (love), and serve God. That’s it folks, the answer to the timeless question is answered on the first page of a grade one catechism. So how better to praise (know), reverence (love), and serve God than to be a sign post, or an arrow pointing to God? Yes, I admit, that sometimes the arrow has pointed in different directions, even to myself, but it’s supposed to ALWAYS be pointed towards Christ and HIS Church! BE AN ARROW! Now comes the important stuff, The Twelfth Article of The Apostles’ Creed, Life Everlasting. One of the most important elements to try and get through to my readers is the idea of everlasting or eternal life. Jesus says it best here in the Gospel of St John Chapter 17:1-3 here “ These things Jesus spoke, and lifting up his eyes to heaven, he said: Father, the hour is come, glorify thy Son, that thy Son may glorify thee. As thou hast given him power over all flesh, that he may give eternal life to all whom thou hast given him. Now this is eternal life: That they may know thee, the only true God, and Jesus Christ, whom thou hast sent. ” WOW! EVERYTHING we NEED to know about eternal life is written in these three verses! Please take some time to meditate on these three verses. From our baptism to Eternal Life, life everlasting, that’s what this life, our life should be all about. Reaching the goal of spending ETERNITY with God. This is our hope and the promise that Jesus has given us! It is why we get baptized to begin with. It all is supposed to come full circle; that we begin with God in baptism and that we end up with God in Eternal Life! These are amazing promises! We will see God vis a vis, face to face, with no creature in between, as He really is! Also known as the Beatific Vision, seeing God face to face. All of this is great, BUT, it comes with a condition. We must cooperate with the graces He gives throughout our lives to the best of our ability, and follow the teachings of Jesus Christ through His Church. Of course we have free will, and God respects the gift that He has given us. If we “choose” to not die in a state of grace, then our souls will be lost forever, they will descend into the pits of hell and be tormented forever. He brings us into His life with baptism, and leads us to eternal life with the help of His Sacraments and those that dispense those sacraments, the Catholic priests. Where sacraments are dispensed, there are the priests! This was just a very short catechesis on the Twelfth Article of the Apostles’ Creed, Life Everlasting, more will follow at some time, if God wills it! May Almighty God protect us from the world, the devil, the heretics, and ourselves! website on He descended into Hell; the third day He rose again from the dead! calgary exterior house painters on Who is Jesus Christ????? Albertha on He descended into Hell; the third day He rose again from the dead! Why is the Church called Catholic ?